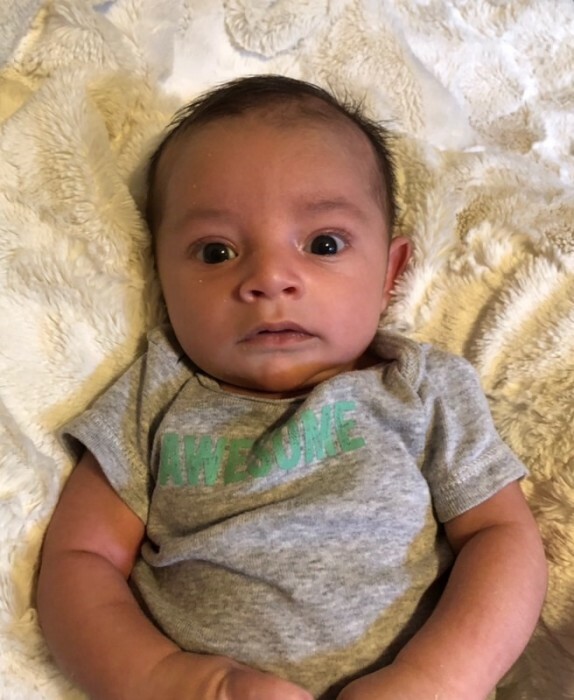 Easton Lloyd Krysti passed away February 8, 2019 at the young age of almost one month. He was greatly loved by his parents, two sisters and numerous other family and friends. Although his life was short, his presence will be greatly missed. He is preceded in death by his maternal great grandfather, Leon Lambert; paternal great grandparents, Angelo Paul and Rosemary Ann Chetcuti. Those left to cherish his memory include his parents, Marina and Clayton Krysti; siblings, Jaydynn and Adalynn Krysti; maternal grandparents, Anita and Ronnie Lambert; paternal grandparents, Mary and Jason Byrd; maternal great grandparents, Nora and Darrell Crager; maternal great grandmother, Ruth Lambert; aunts and uncles, Chris (Amber) Krysti, Jake (Brittany) Krysti, Kyle (Jozette) Krysti and Christian Lambert; numerous cousins, other relatives and friends. The Visitation for Easton Lloyd Krysti will be Thursday, February 14, 2019 from 10:00 AM until the Funeral Service begins at 12:00 PM at Moments Funeral Home. Sam McClure will be officiating. Burial will follow in Red Creek Missionary Baptist cemetery.